Unlock the Box! 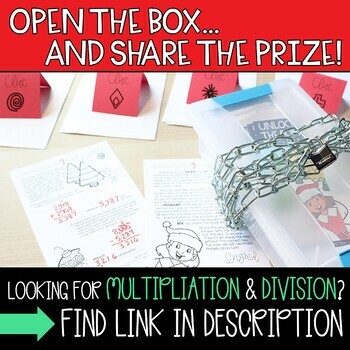 is an engaging math challenge for Christmas, with an addition and subtraction with regrouping focus. An elf named Ingrid has locked a prize inside of a box, and students must solve her clues and find the key to unlock the box! 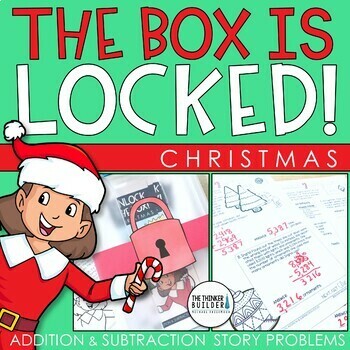 In the first series of clues, students solve engaging story problems about Ingrid the Elf focusing on addition and subtraction with regrouping, which will help them decode a password. 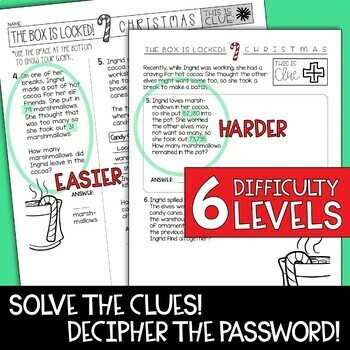 The password is then given to the teacher in order to receive the final page of clues, in which students must decipher a math puzzle that reveals the location of the key. Once students find the key, they’ll unlock the box and share Ingrid’s prize with the entire class! 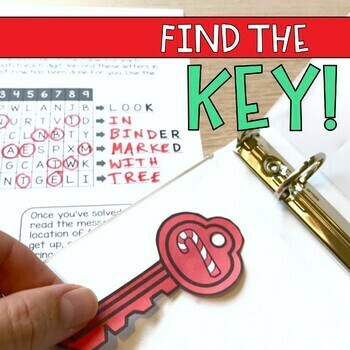 Step-by-step, detailed instructions on how to set up the materials, including: preparing the prize box, hiding the key (two specific options provided), setting out the clues, and leading the activity. All you provide is a box that closes (like a shoe box or storage bin). The math focus in this activity is addition and subtraction with regrouping. Three versions of the clues are provided, each at a different level of difficulty. The challenge is intended to be done in partnerships and without calculators, to practice these math skills. Version A (grade 3) is the least challenging: all addition and subtraction to be done is “within 1,000” (all numbers/answers are three-digits or less); regrouping is needed often. Version B (grade 3/4) is more challenging: most addition and subtraction to be done uses 3 and 4 digit numbers (a few instances of 5 digit numbers); regrouping is needed often. Version C (grades 4/5) is the most challenging: most addition and subtraction to be done uses 4 and 5 digit numbers (a few instances of 6 digit numbers); multiple instances of regrouping within the same problem. Visit me at my blog: The Thinker Builder, or on Instagram, Facebook, or Pinterest! You might also be interested in my Christmas Writing Activities.